Saw Palmetto is an herbal product derived from the American Dwarf Palm Tree. It has gained fame from its ability to reduce the symptoms of Benign Prostatic Hypertrophy (BPH). BPH is a condition where the prostate becomes enlarged. It affects almost every single man on the planet and its prevalence increases with age. This enlargement of the prostate can block the urinary tract leading to problems with urine flow. This frequently presents as having to wait a long time before the urine starts to flow (hesitancy), a poor flow of urine, having to wake up multiple times at night to pass urine (nocturia) and urine dripping for a long time after you have completed urinating (terminal dribbling). Saw Palmetto has been proven on many well conducted scientific studies to improve all of these symptoms. Its positive effects have even been said to be comparable to its prescription medicine counterpart known as Finasteride (Proscar™). Furthermore, it is much cheaper than Finasteride. Saw Palmetto better than Finasteride? Another advantage that Saw Palmetto has over Finasteride is that is does not lower Prostate Specific Antigen (PSA) levels. PSA is a blood test that is used as an early detection for prostate cancer. Finasteride can lower PSA levels up to 41%. This can actually mask a raised PSA level and therefore cause prostate cancer to go undetected. 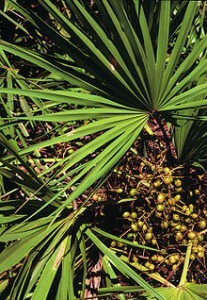 Saw Palmetto has been shown to have no effect on PSA levels. Saw Palmetto has also been shown to be very safe and the only described side effect is mild tummy discomfort. This is frequently relieved by taking Saw Palmetto with food. The effective dose of Saw Palmetto is 320mg per day. This has to contain 80% to 90% of the volatile oil. Saw Palmetto teas do not have the same effect as they do not contain the volatile oils. In conclusion, Saw Palmetto is a safe and effective herbal treatment for BPH. Please check with your Doctor to rule out prostate cancer and other diseases before embarking on any self-treatment. I have some BPH issue and I read from your forum saying Saw Palmetto helps to relieve symptoms. Which type should I purchase and what to look out for? We do not endorse any particular brand. Please see your pharmacist for more information.